The River Cam as it flows past Cambridge University. CAMBRIDGE, England -- "Beware! Rising Bollards!" barks the sign under the traffic light guarding the approach to the single-lane, single-span, cast-iron bridge that arches over the River Cam. Bollards, the steel-and-concrete pillars that rise out of the roadway when that lane's light turns red, are intended to prevent head-on collisions on this historic span along the main artery of this charming university town in East Anglia, 60 miles north of London. Woe to the unfortunate vehicle whose driver ignores the bollard caution. People have been crossing the narrow river at this point since long before Roman legions established a military outpost on the nearby knoll during their invasion of Britain nearly 2,000 years ago. Even after the Latin tide ebbed, the Saxon village that had grown up around the garrison struggled until Viking invaders took over the area in A.D. 878 and turned it into a market center. The Danes even erected the first bridge on this site. Those fierce foreigners eventually also retired to their colder homelands, to be replaced in 1068 by William of Normandy, the French nobleman who invaded Britain two years earlier. In addition to having the first real castle erected on Castle Hill, the Normans changed the river's name to Granta, although the town remained Cambridge. But the town really came into its own in 1209, when a group of scholars and students fleeing hostile citizens at Oxford, the English-speaking world's first college, decided Cambridge would make a dandy place to set up shop. Over the centuries, a collection of loosely affiliated colleges were established, Peterhouse, Pembroke, Kings, Queen's, Clare, Christ's, St. John's, Magdalene and Trinity, to name several of the more illustrious. The University of Cambridge evolved into one of the world's premiere bastions of research and learning, now incorporating 31 colleges. The scholars who have passed through the halls of Cambridge range from Francis Bacon and Isaac Newton to Charles Darwin and Steven Hawking. The roster includes some 82 Nobel laureates, more than any other institution of higher learning in the world. Today's Cambridge is the quintessential university town, with broad lawns and enclosed college courtyards surrounded by venerable spiraling architecture, from the great Gothic Kings College Chapel to the elegant library of Trinity College designed by Christopher Wren. During the school year, Cambridge's cobbled streets and brick lanes are thick with students and bicycles. Tourists enjoy poling punts on the Cam, the flat bottom boats that are this town's version of Venice's gondolas. And Market Square fills daily with vendors stalls peddling local produce, cheese and meats. Cambridge's cultural repositories include a clutch of magnificent museums, such as the Fitzwilliam, the university's trove of art and antiquities and the aforementioned Wren Library, to Kettle's Yard, the charmingly intimate collection of more modern art assembled by Jim Ede, a former curator of London's Tate Museum. All are worthy of a few hours' visit. 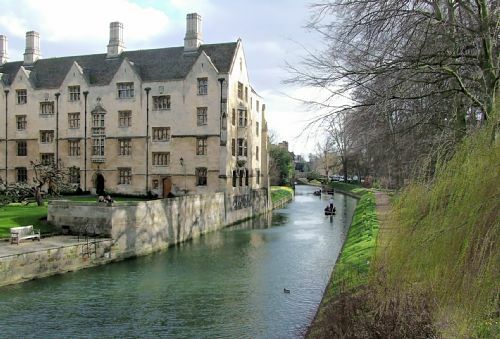 Cambridge's centuries-old pubs and alehouses are also pleasant places to pass some time. But other attractions aplenty await visitors in the English countryside around Cambridge. Three miles west of town, the World War II American Cemetery contains the remains of more than 3,800 American military killed in Europe or the North Atlantic, laid out in a symmetrical field of white markers, while a long marble wall memorializes another 5,100 whose bodies were never found or identified. Ely, a bustling market town 16 miles north of Cambridge, traces its beginnings to an abbey founded there in A.D. 673 on what was then an island surrounded by marshy fens, which inhabitants crossed on stilts. The great cathedral that grew there starting in 1109, became known as "the ship of the fens" because of its twin towers that still can be seen for many miles over the low-lying landscape. Despite the tribulations of English history, the cathedral and its various chapels survived largely intact and remain a living testament to the people and forces that created them. The fens were being drained and planted by the time Oliver Cromwell became Ely's tax collector in 1636. The half-timbered medieval building that was his house, 500 yards from the cathedral, is now preserved as a museum. In 1214, the Barons of England met at the Abbey Church and agreed to force King John to accept the principles of law later incorporated into the Magna Carta. By the 14th century, Bury St. Edmunds had become a center of the woolen industry. Although the abbey was destroyed by Henry VIII, other churches were erected there and its grounds became a public park and visitor magnet in the 18th century, when architect Robert Adam designed the town hall and the Georgian streetscape that make today's Bury St. Edmunds a thoroughly charming place. Even more quaint is Lavenham, 10 miles south of Bury St. Edmunds. which is the most perfectly preserved Tudor village in England. The many black oak, timber framed houses that line its several streets are little changed since the height of its wealth in the 15th century, although some walls are no longer even close to perpendicular. Its collection of shops and tea rooms are perfectly cozy, while the view from the high tower of the equally old Church of St. Peter and St. Paul on a hill behind the town village offers a commanding panorama of the countryside. Long Melford is another stop, a venerable village laid out along a two-mile lane. It includes Kentwell Hall, a redbrick Tudor estate associated with Beatrix Potter and Melford Hall, a moated, turreted Elizabethan abode surrounded by ancient topiary. Sudbury, a larger town that grew rich in the silk trade, was both the birthplace of Thomas Gainsborough as well as a setting for Charles Dickens' first novel, "The Pickwick Papers." The intact Norman keep of Castle Hedingham was built in A.D. 1140 by the son of William the Conquerer's favorite knight, Aubrey de Vere. Although the vast medieval fortress that once surrounded it was destroyed long ago, four floors are open for visitors. The castle courtyard still serves as the setting for jousting tournaments in the summer. So if travel circumstances bring you to England, certainly consider a visit to Cambridge and allow a day or two to explore its environs. And by all means, beware those rising bollards.